I'm FINALLY getting around to setting up a dedicated Wargames space! It's an exciting project for me. A couple of years ago I purchased an 8' x 12'' shed with the specific intention of setting up a haven at home where I could work, play and store my stuff. My long-suffering wife has put up with boxes of my junk for long enough and sanctioned the spend - she's amazing, by the way. So, the shed was deployed in it's LZ and I set to work sorting it out. I lined the walls and ceiling with insulating foam, covered the foam with hardboard sheets and put up a couple of shelves. I put down some old carpet that had been removed from a room we redecorated, then all hell broke loose at home due to a close relative falling ill. My shed became a bit of a dumping ground, was filled with non-"me" stuff and that's how it has sat for the last two years. 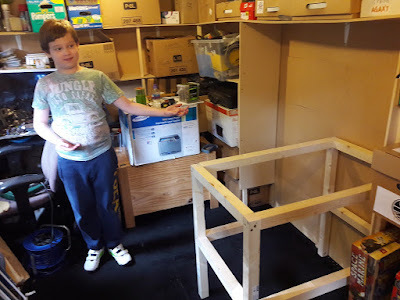 A couple of weeks back I got back into it - I finished building the shelves I'd started and had a bit of a sort-out, unboxing a lot of stuff and putting it on said shelves to make some floor-space re-appear. This weekend - with some invaluable help from my 11-year-old son - I have started work on constructing a games table. Now, I'm no carpenter. My building skills start to fail in direct proportion to the size of the object I'm building. Give me a broken Land Raider, an X-Acto and some plasticard and I'll fix it up just fine. Give me a couple of meters of pine, a hand-saw and some screws and I'll see you when I get out of hospital. You'll no doubt notice that the hardboard lining on my shed is less than precise. I may want to be able to move this thing at some point and having four smaller frames will make that easier. 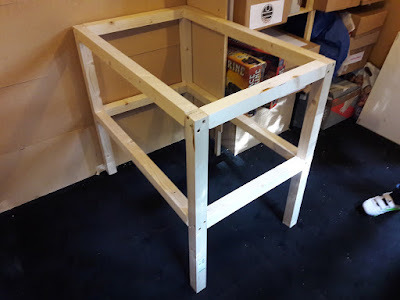 I want a solid center to the table and the center of this will be where the four corners of the four frames all meet so should be pretty solid and able to bear some weight, which the shelf underneath will need to do. I've got some great ideas for home-made double-sided modular gaming tiles - more on that in a few weeks when I've finished building the other three frames and got the shelf and playing surface in place.